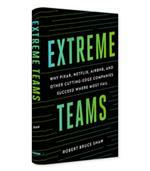 The best teams are more than the sum of their parts, but why does collaboration so often fail to fulfill this promise? In Dream Teams, Shane Snow examines history, neuroscience, psychology and business, exploring what separates groups that simply get by together from those that get better together. 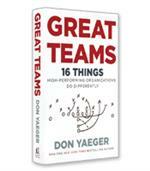 High-performing teams, whether in business, sports or even music, are rare animals. Students and competitors study their successes in hopes of replicating them. 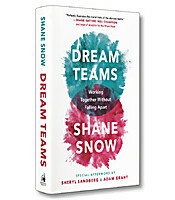 In his book Dream Teams: Working Together Without Falling Apart, Shane Snow takes a different approach. Snow starts with the premise that there is no “one right way” to build a high-performing team. What there is, is scientific proof that dream teams are capable of producing more as a group than their individual team members can. It is that potential synergy that executives should pursue as their primary target. 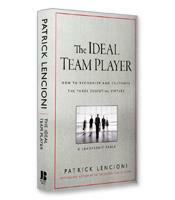 Being a star individual performer should not automatically qualify you as a strong team candidate. 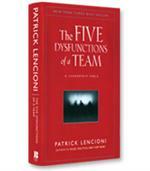 A successful track record in prior team projects should not make you a “slam dunk” for this project. Diverse membership should be based on outcomes rather than appropriate representation of impacted departments. Tension and conflict are inevitable and should be leveraged for their creative potential. Snow informs and educates his readers with compelling stories across a wide range of topics. Malcolm X, the global dominance of Soviet hockey, the history of the Wu Tang Clan, and the failure of the DaimlerChrysler merger are all used to dramatic effect. When Orville and Wilbur were unable to resolve an issue on the strength of their own views, they would switch sides and argue the other’s position as a way to see an opposing perspective. Snow posits that staying in the zone in this way keeps the positive pressure in place without exploding into an outright fight. The author presents a diverse range of stories that convey insights in a humorous and non-academic style. Inclusion: Ensure that everyone in a problem-solving process gets equal opportunity to participate. Staying in the zone: It’s the leader’s job to make sure that tension does not get personal. Expanding the possibilities: Develop and prioritize curiosity. Getting unified: Allow group members to have their own values: Don’t push yours on them. Becoming open: Build bridges by sharing personal, emotional narratives. The book concludes with an eight-question interview session with two invited guests: Sheryl Sandberg, COO of Facebook, and Adam Grant, professor of organizational behavior at the Wharton School at the University of Pennsylvania, who co-authored the book Plan B. In this interview, they share their processes and philosophies on collaboration and discuss how they manage their dramatically different working and writing styles to achieve a positive outcome. Dream Teams uses compelling stories to underscore the reality that team building is more than just diversity and representation. By leveraging synergy instead of chasing a vague notion of what a perfect team should look like, any organization can build a dream team.